Anyone who's tried to sleep through an overnight trip, whether by plane, train, or bus, can tell you it's no easy task. 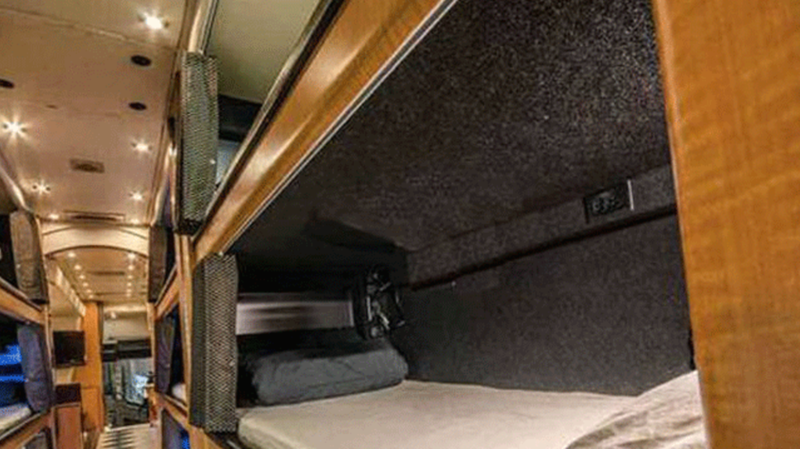 This new company wants to change that with their comfy, bunk-lined buses designed for overnight travel. As Inc. magazine reports, SleepBus has been shuttling well-rested passengers between Los Angeles and San Francisco since late last month. The startup's CEO Tom Currier has compared the experience of falling asleep in San Francisco and waking up in L.A. to teleportation, and for less than $50 one way that doesn't sound like a bad deal. The cost of the ticket includes a bed with a privacy screen, WiFi, a reading light, coffee and tea, power outlets, and access to a bathroom on board. The cabin also includes workstation tables just in case passengers don't want to spend the whole journey lying on their backs. The bus (which is technically a trailer towed by a truck) departs with up to 12 passengers at 11 p.m. and arrives at its destination six or seven hours later. Travelers are allowed an extra few hours to sleep in if they please. Prices for the company's pilot phase started at $48 one way and $96 round-trip. In response to the overwhelming demand upon their debut, SleepBus has taken a break from receiving reservations as they attempt to increase their fleet of vehicles. Tickets are expected to rise to $65 one-way when the service returns in mid-August.